We are grateful to Dr. Edmund P. Pillsbury (verbal communication), who, on the basis of a transparency and a black and white photograph, suggests that the present work is from the studio of Federico Barocci and may be wholly or in part by the artist. Dr. Pillsbury also notes that it is, to the best of his knowledge, the only known example of a multifigured cartoon by the artist. The present cartoon depicts the four disciples placed on Christ's left in Barocci's Last Supper of circa 1592-99, in the Duomo, Urbino. 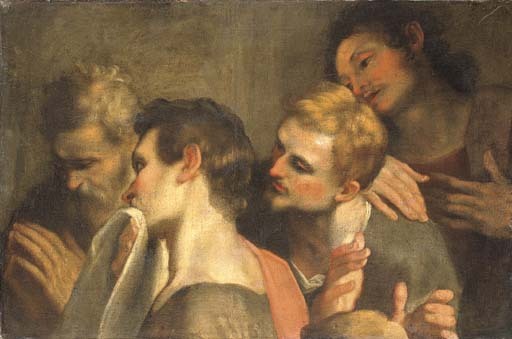 A number of preparatory drawings for this altarpiece are known, as is a period copy exhibited in 1973 with an attribution to Viviani (see A. Emiliani, Federico Barocci, Bologna, 1985, II, pp. 331-341).